Source-to-Sink: The future of sedimentary geology? Some comments and discussion in a recent post about stratigraphy motivated me to finish this post about the future of sedimentary geology, which I started a few months ago but never finished. In January 2008, Nature (#451) included a supplement highlighting International Year of Planet Earth, (IYPE) which is a joint initiative by the United Nations Educational, Scientific, and Cultural Organization (UNESCO) and the International Union of Geological Sciences (IUGS).The supplement contains about 15 essays spanning such topics as deep Earth composition, history of geology, and several about climate-related topics. One of the essays (the only one I’ve actually read), “From landscapes into geologic history” by Philip Allen, covered a broad range of Earth surface-related topics with few words and, in my opinion, did it very well. Erosional and depositional landscapes are linked by the sediment-routing system. Observations over a wide range of timescales might show how these landscapes are translated into the narrative of geological history. …stratigraphers must concern themselves with the interpretation of degradational as well as aggradational patterns. Conversely, the geomorphologist who ignores depositional phenomena is equally delinquent. Wheeler mentions a couple specialties by name — stratigraphy and geomorphology. Almost 45 years later we still have these sub-fields, as we should, but I think we are appreciating the overlap and interdependence of systems more and more. That appreciation and interest is motivating researchers to investigate and unravel the interactions of the systems. The growing field of study of Earth surface processes is uniting the normally disparate disciplines of solid Earth geology, geomorphology and atmospheric and oceanographic sciences. Earth surface processes is indeed a growing field. One might argue that it’s just a different name for what we’ve already been doing. Perhaps it is … but the formalization of it (as evidenced by a journal with that name) is relatively new. Having the discussion of what is and what is not a new discipline and how to define that is not what I’m interested in with this post. I am more interested in the bigger picture. We are we headed? Part of this growing appreciation and interest in the entire Earth surface system, especially with regards to erosion, transport, and deposition of sediment, is an approach that has been termed source-to-sink. I’m not sure where/when that term was coined … it doesn’t really matter. Researchers have certainly been investigating and discussing source-to-sink (or less alliteratively, source-to-basin) aspects of modern and ancient sedimentary systems for a long time. But, again, it seems to me that it is gaining appreciation as an approach in and of itself more in recent years. What do we mean by source-to-sink? One way to visualize this is to think about a single grain of sand. Let’s say you got your typical quartz sand grain that is weathered out of an aging granitic outcrop. What happens along the path from liberation to ultimate deposition? Geomorphologists primarily look at the net-erosional parts of the system (the ‘source’) and try to get clues from the landscape about tectonics. What is the rate of erosion? How does that relate to rates of uplift? Can we study the long-term evolution of a uplifting/eroding landscape and deduce the local as well as far-field tectonic history? How does the climate affect patterns of denudation? Where, when, and why does that sand grain come loose and start making it’s way down system? Sedimentary geologists are primarily concerned with the net-depositional parts of the system, or the ‘sink’. How many times was that sand grain deposited along the way? How long did the whole journey take? How long did it remain in an intermediary location? Where is the final site of deposition before it’s buried and put into the stratigraphic record – in a river? a delta? the deep sea? Why that location for that system? What does that tell us about the system as a whole? And so on, and so forth. The mass fluxes associated with the physical, biological and chemical processes acting across the landscape involve the transport of particulate sediment and solutes. Sediment is moved from source to sink — from the erosional engine of mountainous regions to its eventual deposition — by the sediment-routing system. The selective long-term preservation of elements of the sediment-routing system to produce the narrative of the geological record is dictated by processes operating in Earth’s lithosphere. What’s compelling about this as an approach is the potential for improving our understanding with respect to controls on sedimentation. Sedimentary geologists have for a long time discussed how external forcings such as climate, sea level, and tectonics (to name a few) control patterns of sedimentation. But, I would argue that we still lack a true understanding of the interactions of various external forcings. [I have a paper in press right now from some work I did on a Holocene system that attempts to address this … I’ll post about it when it’s out]. 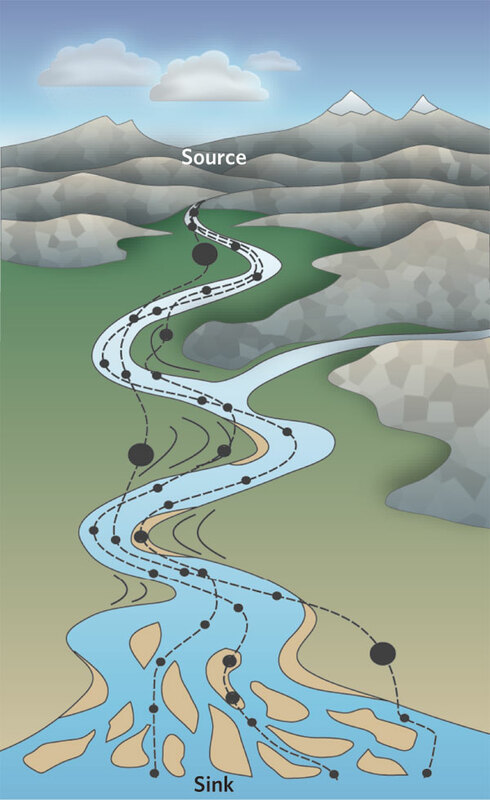 …the sediment flux signal from the contributing upland river catchment is likely to be transformed, phase-shifted and lagged by the internal dynamics of the routing system. If this is the case, how can we possibly decipher the forcing mechanisms for a particular record in deposited sediment without knowing how it has been transformed by the internal dynamics of the sediment-routing system? In other words, if the “noise” related to the transport and deposition of our single sand grain overpowers the signal from the external forcing (e.g., climatic fluctuation) can we even detect it? This is the question at this point. I saw a talk by University of Minnesota geologist, Chris Paola, at a conference in April that concluded that, at least in some cases (and based on scaled-down experiments), the internal dynamics will indeed completely destroy the original signal. Time transforms sediment-routing systems into geology, and like history, selectively samples from the events that actually happened to create a narrative of what is recorded. Progress in understanding modern sediment-routing systems now leaves us poised to answer the important question: how do we simultaneously use the modern to generate the time-integrated ancient, and ‘invert’ the ancient to reveal the forcing mechanisms for change in the past? This is, of course, the fundamental goal of looking at the sedimentary record in the first place (and has been for centuries). Will a source-to-sink approach and integration with other Earth surface processes lead us down a research path worth following? I think so … but, then again, this is what I do, so perhaps I’m biased in my thinking. The real challenge, which is something almost all science will face in this century, is how to effectively integrate and synthesize complex systems while not losing the rich details. In my opinion, this is very challenging … but it is also very exciting. * In terms of a “systems” view, I’m speaking within the context of research activities … that is, conducting new science. A somewhat separate discussion would be implementation of a systems view within the context of geoscience education. This is another can of worms that perhaps my geoblogger colleagues who are educators (Kim, Ron, Callan, etc.) might want to start a thread about. Personally, I’m a strong advocate of appreciating a systems view in scientific investigation … when it comes to education, however, I think the core disciplines of geology (e.g., mineralogy, petrology, structural geology, sedimentology, etc.) are absolutely, positively necessary. In my opinion, an undergraduate requires solid training and experience in the nitty-gritty before integration and interdependence of systems can truly be appreciated. But … like I said, let’s save that for another time … or I’ll tag a willing geoblogger with that. Anybody? UPDATE: Kim over at All My Faults… started a thread about teaching Earth systems here. “I saw a talk by University of Minnesota geologist, Chris Paola, at a conference in April that concluded that, at least in some cases (and based on scaled-down experiments), the internal dynamics will indeed completely destroy the original signal. True … but if we only focus on the noise (i.e., autogenic dynamics) do we potentially miss the big (integrated) picture? Pehaps geologists should be more interested in the noise, especially if by noise one means the record of the complex internal dynamics of the Earth surface systems we study. And note that part of what people interpret as external signal in these systems could well be unforced periodic behaviour of the system itself. Only through understanding this can we have a chance of recognizing the real external signal; currently we don’t. Yeah, I agree … and a lot of work from experimental systems (where the initial/boundary conditions are precisely known and external forcings kept constant) show that. Exactly … that’s why I think it’s a pretty exciting time! Since late 2007 I’ve been reading your clasticdetritus posts (https://clasticdetritus.com/2008/05/28/the-future-of-sedimentary-geology/). I was pretty amazed, in 2007, when I found one person’s work, you, related to the concepts of sedimentary geology while I was doing my bachelor thesis. But now on 2011, as young PhD researcher, I found once more a review/post from you, one named: Source-to-Sink: The future of sedimentary geology? I found your discussion great to fulfill a gap on information concerning the Source-to-Sink concept, and moreover the existence of Allen’s paper. Since in my university at Mexico there is limited access to literature, specially AAAS and NAS publications, it’s been a difficult task to assemble a good conceptual support about certain sedimentary geological topics (e.g., Source-to-Sink). On the latter post, you say [I have a paper in press right now from some work I did on a Holocene system that attempts to address this … I’ll post about it when it’s out]; may I ask for it? It will be of great help since a colleague and I are preparing a manuscript entitled as: APPLING A DISCRIMINANT FUNCTION FOR DETERMINING A RELATIONSHIP BETWEEN DETRITAL MODES AND TECTONIC SETTINGS: AN APPROACH TOWARDS UNVEILING SOME SOURCE-TO-SINK FACTORS. I really appreciate your support, and it will be an honor to invite you as our reviewer, obviously if you accept. We are preparing to launch the MS by and of April. We really need support from native English speakers to acquire a good grammatical expression on our writing. I will wait either response for your article and/or the acceptance to review our manuscript.